AKA how to manipulate your children to get them to bed with minimum fuss. In their combined 11 years of existence, my two youngest children have done what I’ve asked them, when I’ve asked them, a grand total of 7 times. A simple request, like please get your shoes on, should (in a fantasy world) result in the children jumping up, saying “yes Papa”, locating their shoes, and popping them on with impressive efficiency. And maybe a salute too. But it doesn’t. They move like a lethargic sloth. Alternatively, they’re full of beans in which case they somersault or jump their way to the vague direction in which their shoes may be, but get distracted and pick up something to read / play with / eat / press buttons on. A simple task takes thirty-eight requests and one hour longer than required. Sometimes, it’s just a straightforward ‘no’. TV or Roblox comes before EVERYTHING else in their world, so I just get a ‘no’. It’s not that they are rebellious. It’s more like they’re broken. When faced with such challenges, it’s therefore no wonder that I have to come up with various tricks to get my children to do what I need them to do. I’ve written before about how to manipulate your children to get some peace. It’s not really manipulative. It’s merely using things that I know about them to get the job done. Things which I can use to get them to stop saying ‘no’ and to get them to obey. So, I guess it is manipulative, but any parent will tell you that these manipulative tricks are what you need to do to survive, otherwise it’ll be mayhem. If you don’t take control, they will. Here’s some more of mine, this time all related to getting the little blighters to bed. Bedtime never brings out the best in kids. They’re tired, and they don’t understand the importance of sleep. At some point, they will want to have a lie-in and EVERYTHING WILL CHANGE. But these kids are 5 and 6 so they’re still very much of the opinion that bed is their enemy and bedtime must be opposed. We’re lucky that our two are so close in age. It means you can make things a competition. Saying “last one to get their pyjamas on has to sleep in the garden” usually gets a frantic response. (To be fair, our garden is fairly sheltered and I let them keep their duvets.) It also brings tears from the losers which is very unproductive. Actually, this is a terrible suggestion. Let’s gloss over this one. But that’s not to say that taking advantage of their competitive nature with their siblings is a bad thing. You’ve just got to try and not do it in a way that one is left unhappy. Giving them a sense of responsibility over certain acts also helps. If I ask Eve to turn the TV off at night, she’ll argue. If, however, I say “Eve. You are in charge of turning off the TV” then she does it with enthusiasm. She thinks she’s empowered but you’ve actually used that feeling of power to get what you need. It’s Machiavellian but it works. I’m labelling this as useful hint #1. It only took 500 words to get there. Second hint is to do with getting the kids up the stairs. Eve sometimes would lay down and say she was too tired to get up the stairs. She wanted a carry, which wasn’t going to happen at that point with my dodgy back. But she was insistent. She wasn’t for moving. The way I got around this was to tell Eve that we wanted to have a train, conga-style, so take us up the stairs and we wanted her to lead it. She leapt to her feet and then we were on our way up. Sorted. Everyone’s a winner. That’ll be useful hint #2. A routine is gold for bedtime. Everyone should know what is expected of them, whether it’s the child who has to brush their teeth and have a night-time pee, or the adult who should be reading them a story before their TV programme starts. This is a time for winding down, not for surprises or crying, if possible. As parents, we must be constantly managing the expectations of our children to help prevent disappointment. Useful hint #3 is therefore to make a plan, share that plan with your kids, then stick to it. This requires the adult to be organised so, you know, be organised. Since moving from one session books (hello, Julia Donaldson) to full chapter books, we’ve found that the kids are more excited about getting into bed to get a chapter of their new book. The continuity, the anticipation, the joy of progressing in the story and learning about the characters are all things that the children like, and are therefore things that we can threaten to take away if they don’t bloody behave. Sound harsh? Well, tell me if this, or something similar, hasn’t been used by you. “If you don’t hurry up and get your pyjamas on then we’ll not have time for a bedtime story“. I thought so. Chapter books have more depth, and the kids love the idea of reading more grown up stories. It’ll make them get ready for bed much, much faster. I’m claiming that as useful hint #4. Discourage anything that seems in any way hyper. This is a period where we should be slowing them down. No jumping around, shouting or arguing. Quiet, peaceful tranquility. 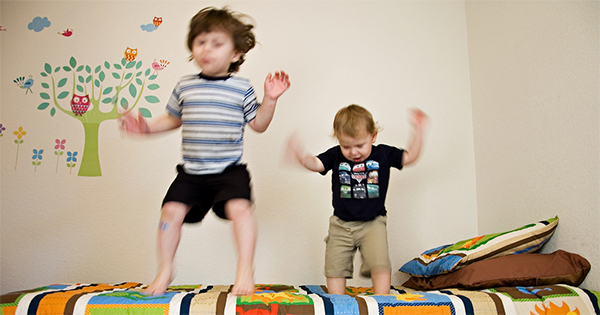 Look at the kids pillow fighting in this stock photo. I’m telling you, their parents are not getting peace any time soon. Actually, that hint is pretty obvious. I’m not going to claim that as one of my five. You deserve better. Useful hint #5. After the story, but before the goodnights, sing a little song with them. Try and make it the same song(s) every night, and sing the song slightly slower than what they’d expect. Control the tempo right, and you can reinforce the slowing down of things ready for sleep. Make it something simple and familiar. For the most part, I’d maybe not use anything from The Prodigy’s back catalogue. So, there you have it. Five priceless hints on how to manipulate your children into going to bed with minimum fuss. Pillow fighting photo by Allen Taylor on Unsplash. Feature photo by Annie Spratt on Unsplash. Previous Article You've Seen the Film. Now Watch the Netflix Series! AH, the competition is a good hint. Also, ban screens long before bedtime. Ideally an hour before, especially iPads etc. I find they wind the kids up. We’ve started doing this. No ‘screens’ (laptops, phones, tablets) after dinner. Just books and toys. Old school! Ha the bit about getting them up the stairs is so true! One minute their legs are too tired and with the right incentive suddenly they are bounding up there like they are Tigger! These are great tips…I have to stagger tooth brushing or else they just distract each other or fight! I’m like, how hard can it be to just brush your teeth! Great tips! Its like rounding up sheep with my youngest three, its my least favourite part of bedtime! Great tips, my kids use every tactic once they are in bed to get back out of it! Although I remember doing it too!!! Guys. We need to talk.